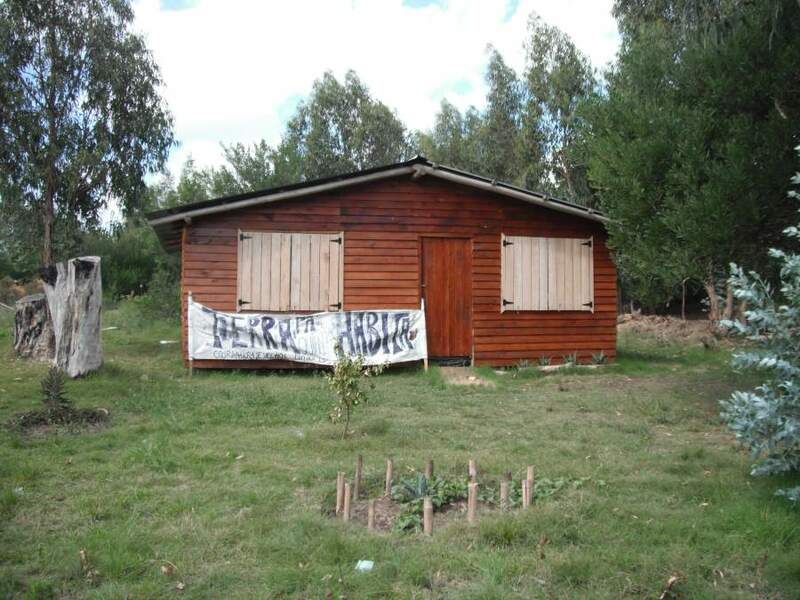 On March 31 Delma ended her hunger strike so she can be more active in other ways to help stop the evictions in Cumbres and other parts of Uruguay. We will continue to update this page. I spent about 10 days talking to Delma and the people who live in the Cumbres neighborhood. Everyone I talked to was very nice. There is a misconception by many people that this is a "slum" or a hippy squatting place or that the people are lazy and don't want to work. But the people there are normal Uruguayans for the most part. They are very interesting people. Most of them work regular jobs but were not able to buy their own land because of the low wages in Uruguay. For many of them, this is a chance to make a dream come true - a dream of building their own home. One man I talked to, Daniel, who is a sailor, told me that the past four months, since he finished his house, have been the happiest of his life. He said he put each nail in with love as he built his house. I am very afraid the government will one day kick everyone, or nearly everyone out and destroy their homes. This happened in Punta de Diablo a few years ago. I learned about what happened there by talking to the residents in Cumbres. When I found videos of the destruction I could hardly believe this happened in Uruguay. I thought Uruguay had more heart, more empathy, more compassion. And it happened while the Frente Amplio (Broad Front) political party was in office at the national level. But destroying homes is something I would associate with a right wing party or a dictatorship, not one of the most liberal governments and most socially advanced in South America, if not the world. Uruguay is a leader in many areas, but I am afraid they have a ways to go before they form a better solution to the housing and land ownership problem. Delma and others have been convicted of "usurping" the land. But no one seems to be thinking about what the Spanish did when they arrived here. It would seem fair to say that they were the original usurpers. All of this has made me do a lot of thinking about land, rights, needs, power, police, judges. I am sure we can come up with a better way of living together. Apoderarse de un bien o derecho ajeno, generalmente por medios violentos. This means basically to take control of something, usually by violent means. The Spanish did use violence, even deadly violence, but the people living in Cumbres did not, so which was the greater crime? By the way, while I was staying in Neptunia I met several people with Charrua blood who are living in the Cumbres neighborhood. The Charruas were one of the indiginous groups living in what is now called Uruguay. The Spanisly basically exterminated nearly all of them. Read about the massacre at Salsipuedes, for example. I have been living in Uruguay 3 years and had never heard much about what the early Uruguayans did to the Charruas. It isn't something they are proud of. But I believe it is something which we all need to remember, especially as people like Delma are being forced from their homes in what is called a "legal" way.But it is good to remember who wrote the laws and whose interests they serve. History is full of cases where laws are not written by or for the people who become victim to them. So far, what is happening in Uruguay seems to be another example of this. I am hoping that enough thought will be put into this so a better solution will be found, rather than simply force people out and tear down their homes to make way for people who have more money. There is already enough inequality in Uruguay and the world. And by all the statistics I have seen, it is getting worse. Perhaps those in power in Uruguay will find it in their hearts to use this as a chance to help those who have few financial resources and thus reverse somewhat the trend towards inequality. - About the law that says trucks can't use the highway on weekends and holidays. So they sometimes use Ibirapita. But the city doesn't maintain the road. In the winter when it rains a lot, it is muddy and difficult to use. - That there are no public lights, but some people are paying for their electricity here, which includes a fee for public street lighting. - One resident who has lived her over one year told me no one from the city has ever stopped by to ask what he or the residents need. Here Ñata is taking Dely's blood pressure. She comes each day to check on her. Ñata has Charrua ancestry. The police did not tell her why she was being taken to the police station. They said, "They will tell you when you get there." She was held in a very small, uncomfortable room over night, with no bed to sleep on. Her partner and son were not allowed to visit her or talk to her. had built, or she would be put in jail. https://www.youtube.com/watch?v=3fp1mGkcmJw Paremos los desalojos! Tierra para quien la habita! Remansos is another neighborhood in the Neptunia area. It is the place I had heard the most about and was looking up on google when I learned about Dely. City community hall building being used as a type of school or cultural center where there are alternative type classes for pre-school children. This is run by a neighborhood committee. The building and the land belong to the city.